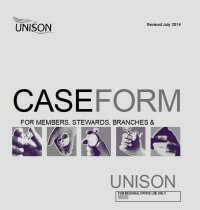 Information on how UNISON’s representation system works. Your first point of contact is your local elected steward or your departmental convener. You can get their details here. Stewards need to be trained and accredited before they can represent you and they need to periodically update their accreditation with further training. Health & Safety reps are fully trained and have a workforce-wide responsibility. You can also contact the UNISON branch office on 0131 558 7488 or by clicking here to email. You can also contact UNISON Direct on 0800 0857 857. Calls are free from landlines and mobile phones. Our helpline is open Monday – Friday 6am – midnight. Saturday 10am-4pm. Closed on Sunday. A team of trained and experienced lay officers represent members alongside a network of shop stewards. They are backed up by a full time officer allocated to the branch and have access to specialist officers (eg legal, pensions etc) at Scottish and UK level. The team comprises Service Conditions Co-ordinator, Convenors and five Service Conditions Officers. The Chair, Secretary, Equalities and Health and safety officers are also part of the team. Much of the departmental or sector (like the voluntary sector) work will be done by Shop Steward Conveners elected at local level, but always with the availability of officer support. Grievances: A procedure for settling staff grievances are usually agreed between the union and employer, and all employers should have one. A member, or group of members, can raise a grievance which may be anything from application of a pay scale or being given an unreasonable instruction, to issues like bullying or harassment. Disciplinaries: Procedures for dealing with disciplinary matters are also usually agreed between union and employer. They typically include investigation, disciplinary hearing and appeal stages. The employer should have an outline list of acts which would constitute ‘gross misconduct’, or a sacking offence. It is important to note that the level of proof is not “beyond reasonable doubt” but is based on a “reasonable” conclusion in light of the facts. Conditions and agreements are negotiated at national level for groups of employers, at local level across an employer and sometimes at departmental level. The branch is committed to national bargaining being the main structure. The branch’s rules make it clear that no officer or steward has the power to enter into agreements without direct consultation and approval from the members concerned. Talks on conditions or agreements will be initiated by the employer, or by a claim from the branch. A specific officer will usually be allocated to specific issues, with the lead negotiators becoming directly involved in corporate issues, rather than local ones. However a close overview of local activity is needed to ensure that corporate agreements are not being undermined by unhelpful precedents being set. Contrary to common opinion, most negotiations tend to be business like and low key with a great deal of detailed, as well as general discussion. The negotiation process often involves a good deal of research and fact finding. Most agreements are reached by negotiation and a position is arrived at that satisfies both the union and the employer. Industrial action is the last resort when all other ways of resolving a situation have been exhausted. Industrial action hits the employer but it also hits the members taking action. They lose their wages and they risk losing their jobs. That is why the branch only ever considers industrial action after a consultative ballot of members. Approval then has to come from senior full time officers (and a national committee of lay and full time officers) for an official ballot and strike pay. that there is an accountable strike committee with clear procedures for contacting and consulting members.